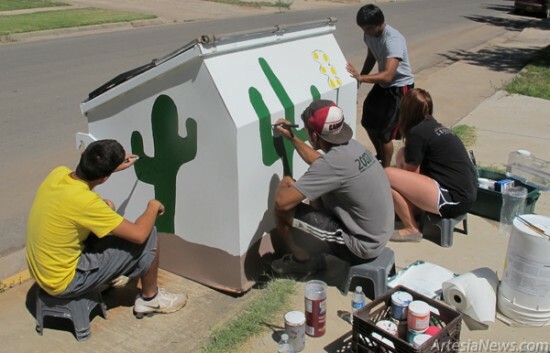 From left, Javy Lujan, Jeremy De La Rosa, Karsten Garcia and Jesus Lares with Artesia Clean & Beautiful paint a desert theme on one of the dumpsters at Central Park Thursday morning. According to Linda Stevens, executive director of Artesia Clean & Beautiful, her summer help has been very busy this season, collecting over three tons of e-waste, painting three other dumpsters in Jaycee Park, and cleaning up numerous yards, homes, etc. Her workers’ last day will be Aug. 9.